Lovely island. Comprehensive walking tour. No free time to speak of, however. Excellent guide, combo of panoramic coach tour, with walking about 45 minutes in the heart of the city. Would have liked more free time. It was okay. Since it was a short day at port we did the tour. The presenter did a wonderful job but it was slow paced and we kept backing up into the next group. Loved Cagliari, beautiful city, the guide was fabulous, local lady who gave excellent information during the tour. Again, we are not beach people, so this tour was perfect for us. 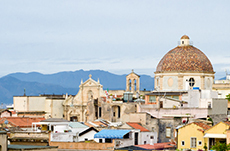 Good overview of Cagliari, but the city itself is not impressive. Day started out raw and rainy. Very pretty area and nice tour. Very well organized city tour - bus and walking. Very well organized city tour - bus and walking. Knowledgeable guide and had free time at the end to walk around the Christmas Market. Not a great deal to see though the countryside is charming in an arid kind of way. Included free tour, with bus to hilltop viewpoint, walk through old town, and commentary from a great guide. The guide was excellent but the city was dull. We were really disappointed by this port. Both the bus and the guide were horrible. Both the bus and the guide were horrible. Our tour group chose to walk back to the ship mid-tour. This is a horrible port with nothing to see. My wife and I sailed on Holland America Eurodam for our first Western Mediterranean cruise. Lovely views from the top of the city and friendly knowledgeable guide.